MPs will soon decide the fate of Theresa May's Brexit deal. There are many views about why they should back or reject the deal, which was struck late last year with the European Union. This suggests some voters could yet be won round to Mrs May's proposal. No deal or a 'public vote'? The most popular every time - backed on average by just over a quarter - has been to leave without a deal at all. Meanwhile, the second most popular option each time - supported by just over a fifth - has been to hold a "public vote" on whether to accept the deal or to stay in the EU. Holding a "public vote" on the deal, with an option to stay in the EU, is favoured among backers of Remain, 38% of whom pick this option. Fifteen per cent of all voters prefer attempting to negotiate a better deal, while 12% back Labour's preferred option of holding a general election. A further 9% support a different "public vote" in which the choice would be either Mrs May's deal or leaving the EU without one. Polls asking whether there should be a "public" or "people's vote" - without specifying what the options would be - typically find that the idea is relatively popular. For example, Survation found that 48% support holding a "people's vote" to gauge the public's reaction to the deal, while 34% are opposed. Similarly, Populus reported that 44% believe the public should have the "final say" on the deal via a "people's vote", while just 30% are against this. ComRes has reported as many as 50% oppose "holding a second referendum on whether to Remain or Leave", with only 40% in favour. 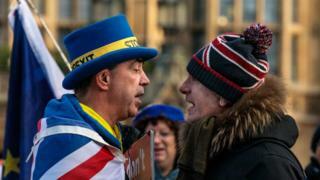 Similarly, according to polling commissioned by Lord Ashcroft, a former deputy chairman of the Conservative party, 47% are against holding a "second referendum", while 38% are in favour. In that scenario, voters would choose between leaving the EU under the terms of Mrs May's deal and remaining in the EU. Putting "the people" in charge of Brexit appeals to some Leavers, but a ballot which could potentially reverse the decision does not.